Seeing liquid oozing out of your goat’s eye can be an alarming experience. Being familiar with common causes of eye discharge in goats can help you deal properly with this health problem--before it leads to serious complications, such as blindness. Eye discharge in goats usually occurs as a result of a foreign object, such as a piece of hay or straw, that has lodged in your goat’s eye. However, it may also indicate a more serious problem, such as a pinkeye infection. Note the color, consistency and quantity of the discharge. Yellow or green pus often accompanies pinkeye in goats, while a mild, clear discharge indicates a foreign object. If your goat develops eye discharge, isolate it until you can rule out pinkeye as the cause. According to the Alabama Cooperative Extension System, other signs of pinkeye include cloudiness, redness, swelling and ulcerations on the surface of the eye. Pinkeye-related eye discharge can spread the infection to the rest of your goat herd rapidly. 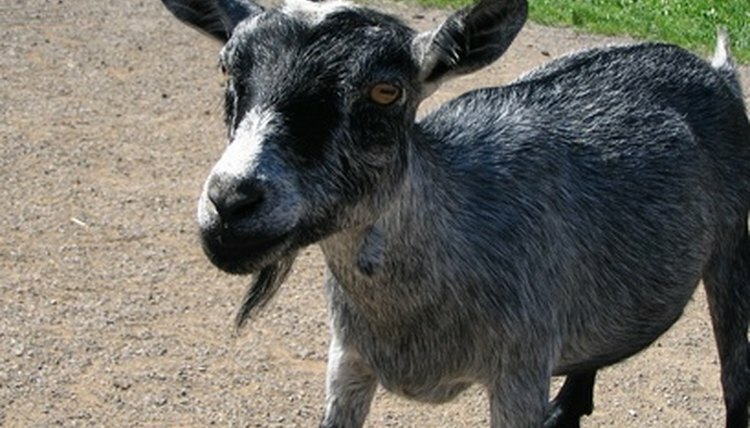 According to the Alabama Cooperative Extension System, more than 80 percent of a goat herd can develop a pinkeye infection during an outbreak. Put on rubber gloves and check your goat’s eye for foreign objects, such as hay chaff. Flush the eye with a sterile saline solution, which you can get from a livestock supply store or online site. If you notice signs of pinkeye, take your goat to a veterinarian for antibiotic treatment. How Come Friendly Goats Turn Into Mean Goats?